Some market watchers, such as Cornerstone Analytics (CA), have consistently stated that the underestimation of demand, coupled with over-estimation of supply, will mask the growing call on Organization of Petroleum Exporting Countries oil in the second half of this year. CA noted that global demand outstripped supply by 4 million barrels in April. This comes in addition to the mounting evidence that the oil market, via rig count declines, slowing production growth, higher demand and huge API crude inventory declines, is starting to readjust. Be that as it may, Goldman Sachs (GS) seems to believe oil must fall to $45 by October to clear the market and re-balance. In fact, there is growing evidence that not only are we slowly re-balancing but the world may actually be running short of oil. According to Reuters, Saudi Arabia has turned down requests from China for more oil, as they are using it for their own domestic refining needs. In other words, asset prices continue to be set by central bankers, and not free markets, so the GS call does make sense if you believe fundamentals do not matter at all. Rather than being based on the fundamentals, GS, like others, have consistently been off the mark when it comes to oil prices, but refuse to acknowledge it. 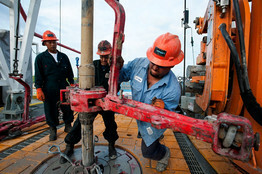 Oil companies indicated that rigs could begin to be added back into operation when prices reach around $70 per barrel. Producers hurt themselves by providing a set price, which affects how oil is traded. But to be clear, we know for sure rigs will not be added at $50, never mind $45. Once you factor in the natural depletion of existing wells, production will have to eventually go down ― another reason why the GS call will be wrong.